And sometimes it’s the simple Saturdays spent at home. The early Autumn sunshine, spiders gleaming webs, early morning banana pancakes. It’s the being together, the blueberry stained faces and clamours for more. It’s the cups of tea, more tea, more tea until the bleary headache of a disturbed night is banished. It’s bundling out of the house to go swimming, it’s delighted giggles and splashes and laughter. It’s a boy tightly clinging to my neck as new experiences overwhelm. It’s the grace of friends in helping put up blinds, the taste of fresh bread for lunch. It’s the discovery of hallway shoe storage, the potential of bookshelves, the bringing of beauty and order to the chaos of life. It’s sleeping beauties in the back of the car. 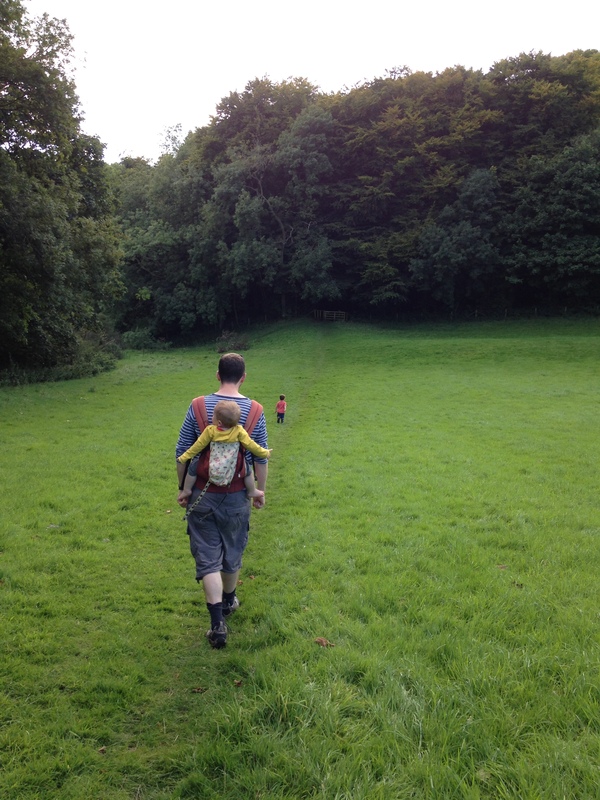 It’s muddy boots, wellingtons and rambling through woods, conkers in hand. It’s laughter and coaxing the small boy into enjoyment of the afternoon. It’s wide open fields and loud long echo’s, it’s shouting and laughing and running and falling and running again. It’s tree climbing, stick holding wonder. It’s amazement at holes in the ground, it’s the promise of ice cream to take just one more step. It’s tea and cake and flapping arms for more. It’s pottering with lego, dinner in the oven, burgers and chips tasting sweet in our mouths, it’s laughter and manic giggles as the boys play together at the end of the day. It’s kisses and baths and it’s warm sleepy bodies tucked into bed. It’s heading out running over the downs, music playing loud in my ears. It’s finding the rhythm and singing along. It’s enjoying the grace of this place we now live, the pink glowing downs and aching legs. It’s coming home to beauty in blinds, a husband who loves and a glass full of wine. It’s sitting and remembering and loving and delighting in Saturday’s here.